Majadito is a dish from eastern Bolivia. Made with different meats and served with fried eggs and some delicious plantains. This is one of my favorite foods. A dish that takes me directly to my country Bolivia. It is also one of the first meals I learned to cook. You can use several kinds of meat to make majadito. The most popular are beef jerky and duck. Growing up I think we had it mostly with beef. I find it easier to make this dish using chicken. Generally when done with chicken, a whole chicken is used, but I usually make it with chicken breast and thus shorten my time in the kitchen. You can use boneless, skinless chicken breast, as I used in this recipe, and the only thing you need to do is just cut it. 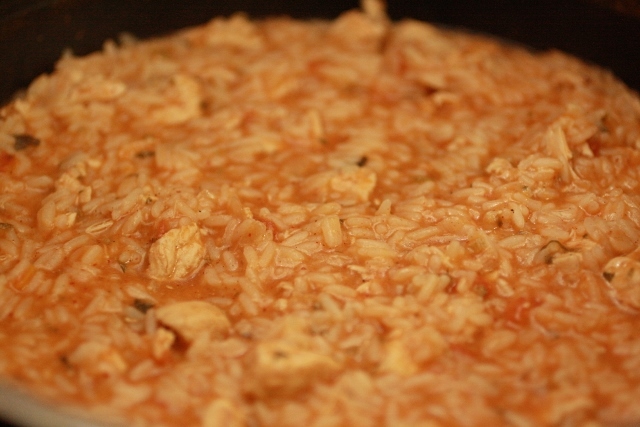 Often I use chicken breast with the bone, put everything to boil and then shred it and use the broth to make majadito. Like all home-cooked recipes, each home makes it a little bit different, adding different ingredients. 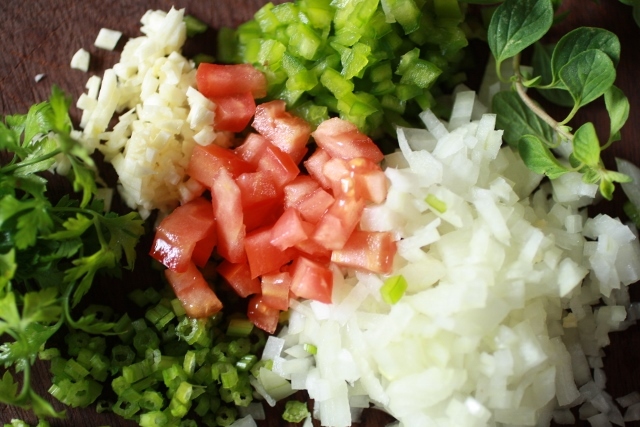 I think many Bolivian meals start with a base of sauteed vegetables: onions (red onions), green peppers and tomatoes. To this basic recipe I usually add garlic and celery. Majadito has a bright orange color due to a seed called urucú (achiote). These seeds need to be heated in the oil in order to release their color. They´re heated in the oil used to fry vegetables (removing them before adding the vegetables). Now days in Bolivia you can find ground urucú and that makes it easier to add it to any meal. In Paraguay I don´t have that, and to give it that color I add tomato extract. This majadito recipe is how I make one of my favorite Bolivian meals without having all the necessary ingredients, but without changing the delicious flavor of this meal. 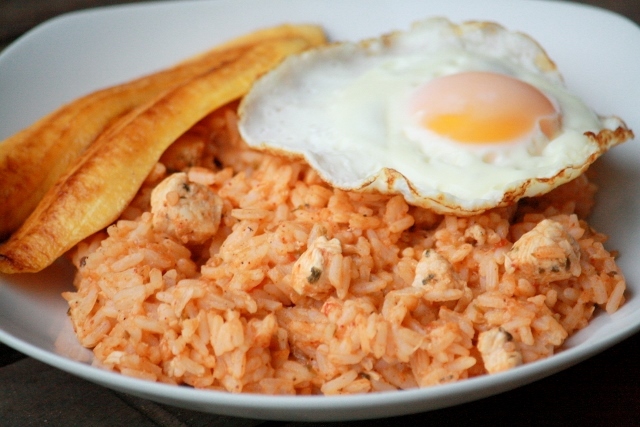 Serve majadito with fried egg, fried plantains, and some llajua (homemade spicy sauce). I think avocados go perfectly well with majadito. Note: This recipe was published for the first time on June, 2016, on my old blog. 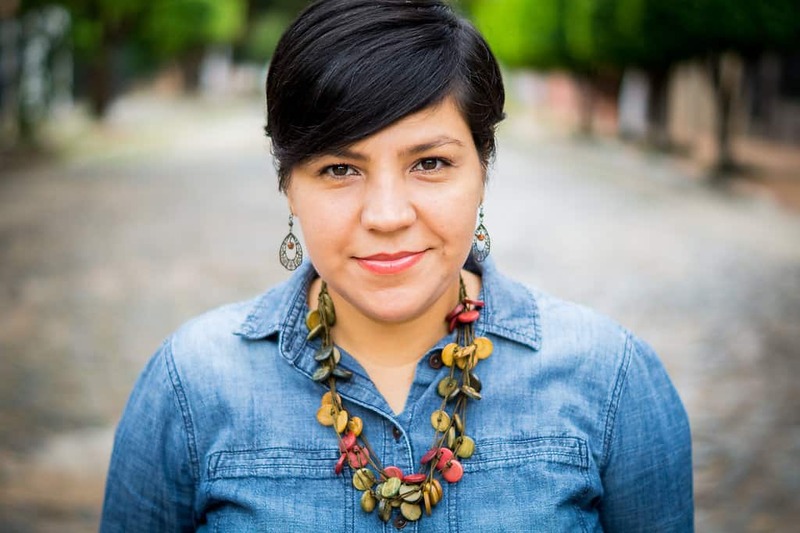 As we celebrate Bolivia’s independence in the month of August, I thought it was a good time to update my Bolivian recipes. 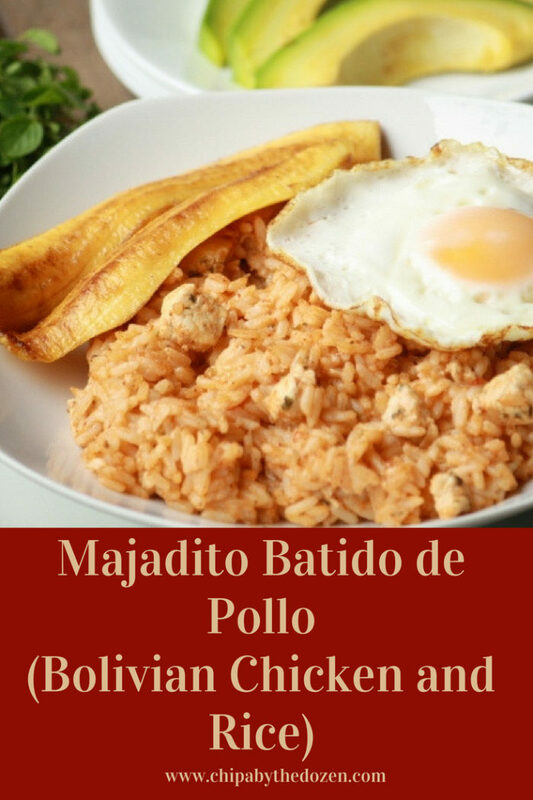 Majadito is a delicious chicken and rice dish. Serve it with a fried egg and some plantains. In a big pot, add oil and saute onions, garlic, green pepper, celery, oregano and parsley, for about 5 minutes. Add the chicken, cook for 3 minutes and then add the tomatoes. Cook for another 5 minutes. Add chicken broth or water to the pot, wait until is boiling and add the rice, salt, pepper, cumin and tomato paste. Cook in low heat, stirring every 2 or 3 minutes. It takes about 25 to 30 minutes for the rice to be done. It needs to be a little bit soupy. 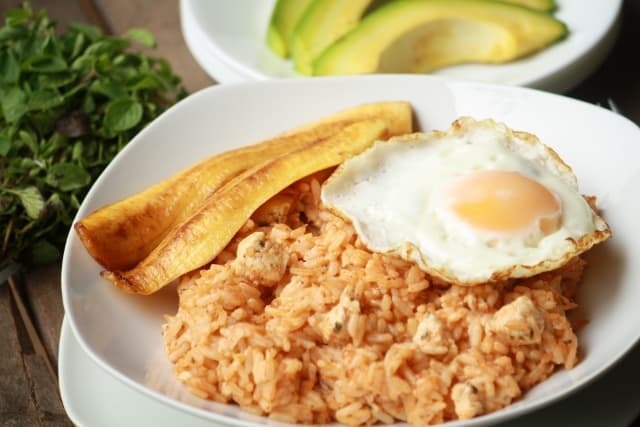 Serve with fried eggs and fried plantains. How much tomato paste do I use? It doesn’t say in the ingredients. Hi Luis. Thanks for catching that error. 4 tablespoons. I hope you like it! Eso son colladas. El majao se hace con carne seca. 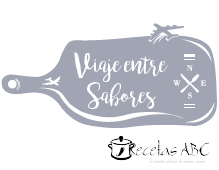 Gracias por pasar y vistar el blog!